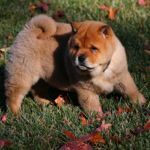 just got my chow back in april he is a little over a year old. im not sure if this is anxiety or if he's just a puppy still. he is constantly crying and whining. and it gets even worse when i leave the house. its so sad, he always has tear marks under his eyes:( he is defiantly a lover, he even cries when he sees the neighbor across the street get in her car and drive off. same with the mailman and UPS guy. and when we take him on walks and he sees another dog, he always wants to say hi and the other dogs owner will tug away and keep walking and my chow will literally hysterically cry and whimper. even when i am home he can be sitting next to me and im petting him and he whines. im getting nervous because when i am not home he gets grumpy and is rude with other family members by growling. i am now concerned because he will not eat unless i come home and am in the room with him. if i walk away he stops eating. he can have a full bowl of food and wont eat until i return. just curious to see if anyone else's chow cries as much as mine! or if it just a puppy phase. so please let me know if their are any training tips you suggest! You state "i just got my chow back" i was wondering where was he? It‘s hard to give some suggestions without knowing his history. Maybe that has some reasoning as to why he is crying\whimpering. I think he meant "back in April". I agree more info is needed. Growling at other family members is a concern. That being said, if he is a little over a year now, he was over 6 months when you got him...was he a rescue? If you got him direct from the breeder, then he spent a lot of time with them. 8 to 10 weeks is normal. So, either way, i think that he probably has some separation anxiety. He is either afraid that you won't return or is not adjusting to being away from his original 'pack'. He needs to have his confidence built up. Since he is already displaying a food dependency with you, work with that. Give him a small portion of his meal, let him start eating, and walk away. Have a family member or friend give him the next portion. Have them stay in the room and then join them both. Work a similar routine for treat training. Introduce someone else to teaching him basic commands and rewarding him for doing them properly. Get him into situations where he can interact with other dogs. If he really wants to be social, get him to a dog park or petstore that is friendly to dogs on lead. That should address the whining, whimpering, or othewise 'rude' behavior. As to the crying and tear stains, make sure that he doesnt have an eye issue. It may be related or it could be a medical issue (entropion or an infection) that you want to rule out. I suggest during your free day visit some house of your relative and let them walk your chow, in that way he well nice to your family member. You have to train your dog and tell him his not doing right.